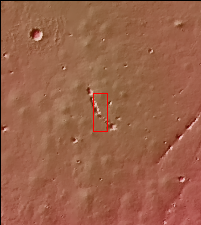 This VIS image shows a linear depression in Syria Planum. Volcanic activity, including broad shield volcanoes and extensive volcanic plains created this region of the Tharsis system south of Noctis Labyrinthus. Linear features, like the one in this image, can be caused by several different processes. In this case a combination of tectonic forces and lava emplacement created the depression.